1 Preheat oven to 400°. Line baking sheet with aluminum foil or spray with no-stick cooking spray; set aside. 2 Combine all ingredients except fillets in medium bowl. Arrange fillets on prepared baking sheet; evenly top with Mayonnaise mixture. 3 Bake fillets 10 minutes. 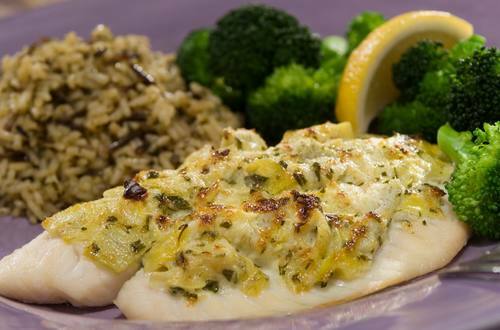 Set oven to broil, then broil fillets until tops are golden and fish flakes with a fork.